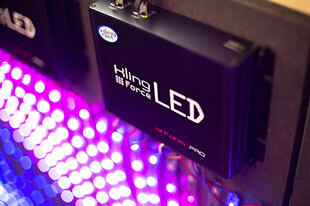 Kling-Force LED is an interface designed to drive LED strips. There are now many LED strips on the market with various densities, format and prices. 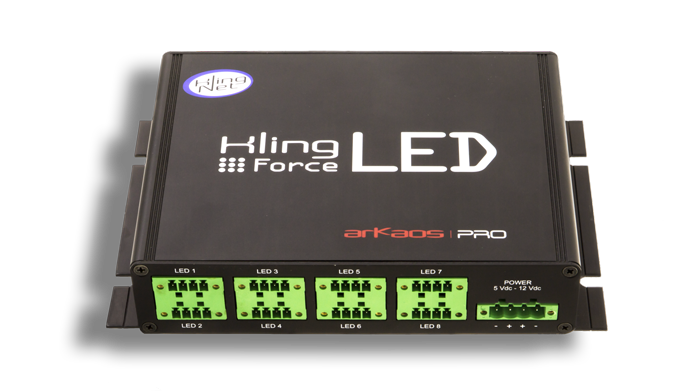 Kling-Force LED makes it easy and affordable to drive them from an ArKaos software acting as a media server. The Kling-Force LED has 8 outputs and supports the most popular LED strips on the market. 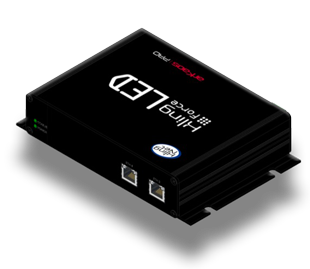 It distributes up to 40 Amp of power to those LED strips. The power supply is external, so that the user can choose 5 or 12V based on his installation. At 5V power can reach 200 W and at 12V it can reach 480 W. The interface distributes the power without converting it, otherwise it would dissipate too much heat. The output voltage must always match the input voltage, as the interface will not convert between 12V and 5V. The interface also provides some electronic surge protection that will cut if the output drains too much power or if there is a faulty wiring such as a short circuit. The interface will also detect when the conditions are back to normal and will start powering again the LEDs automatically. Kling-Force has 2 Ethernet connections to daisy-chain multiple Kling-Force interfaces. Kling-Force LED can power up to 1600 (8×200) LEDs or drive up to 3200 (8×400) LEDs if strips are directly powered. Each output is limited to 5 Amp, so the number of LEDs depend on the LED strip specification. The media server can also receive feedback from the interfaces. For instance, the Node Properties panel displays how much power is consumed by each individual output. Each individual output is also protected against electrical short circuits or against a too heavy energy consumption. The interface will automatically detect abnormal energy usage on any output and will protect itself and the power supply by stopping powering the faulty output.